Social media has become an essential communication tool, both for individuals and for businesses. 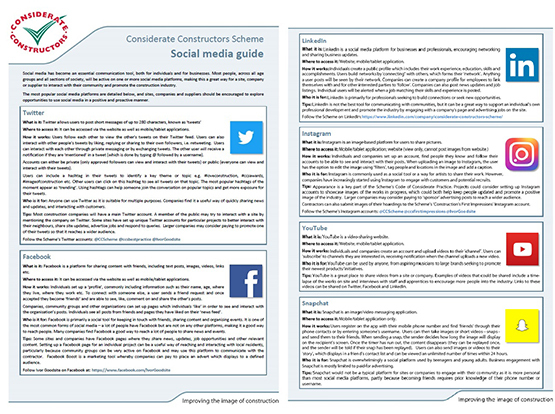 Most people, across all age groups and all sections of society, will be active on one or more social media platforms, making this a great way for a site, company or supplier to interact with their community and promote the construction industry. There are a number of social media platforms, each with a different audience and purpose, and it can be difficult to distinguish between them and decide which platform is right for business purposes. Sites, companies and suppliers should be encouraged to explore opportunities to use social media in a positive and proactive manner.